The alpha will go live in late April. 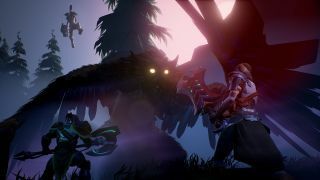 Fans of virtual monster-hunting will want to keep an eye on Dauntless, as it's the rare entry in the genre not to require a handheld system. PC Gamer's Tom Marks seems pretty excited about its launch, scheduled for late this year, but there's a chance you'll be able to play an early version later this Spring. There's an alpha test incoming, is what I'm saying, and if you want to put your name down, you can fill out a handy online form available here. It's not a guaranteed way into the alpha test, and there are some odd questions on there including 'What are your top 5 favourite games? '—you'll also need to be able to supply a DxDiag.txt file, and sign up for a Dauntless account from the official site. As the accompanying blog post reveals, the alpha test will go live sometime in late April, after which regular testing "will continue on a steady cadence into summer". As for what to expect from the test, "Dauntless will be in an early Alpha state and we want you to give feedback even though it’s unfinished. For example, we may turn 500 people loose to fight only Drask for a day to properly balance his encounter. We may unlock a new weapon or armour set to test how well they perform in the heat of battle. There will be bugs, glitches, and unfinished content; it’s all part of the process". You can see Dauntless' system requirements here.